The rent at Dove Landing Apartments ranges from $799 for a one bedroom to a $918 one bedroom. Apartments in this building are about 20% less expensive than the Virginia Beach average. This is a pet-friendly apartment. 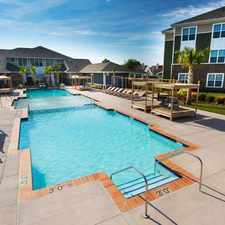 Dove Landing Apartments has a Walk Score of 54 out of 100. This location is Somewhat Walkable so some errands can be accomplished on foot. Dove Landing Apartments offer a nice selection of newly renovated, clean, quiet, well-managed apartments conveniently located in the heart of Hampton Roads. You'll find fine living with good neighbors, and you will not be bothered with aircraft noise. We are within minutes of the Chesapeake Bay, Bayside Recreation Center, Cypress Point Golf Course, Military Circle and Pembroke Malls and the Military bases. Also, we are on the HRT bus line. The breath-taking amenities at Dove Landings make it hard for anyone to want to leave. Explore how far you can travel by car, bus, bike and foot from Dove Landing Apartments. Dove Landing Apartments has minimal transit which means it is possible to get on a bus. Dove Landing Apartments is in the city of Virginia Beach, VA. Virginia Beach has an average Walk Score of 33 and has 437,994 residents.